We offer our valued customers a credit account to suit their needs. A Simpsons account consolidates your bulk fuel and service station purchases in one easy to follow monthly statement. To apply, download an application form and submit it for approval to admin@simpsonsfuel.com.au. Contact our accounts administrators on 03 5772 1205 with any questions. 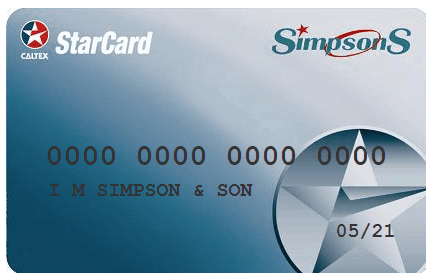 Simpsons StarCards are available for approved credit accounts, allowing you to access fuel 24/7 Australia wide. Simpsons Local Cards (White Cards) are available for approved credit accounts looking to access fuel at Simpsons sites across Murrindindi & Mansfield shires. Account statements are sent by email or post at the start of each month. Monthly payments can be made by BPay, direct debit, credit & debit cards or bank transfer. Accounts are subject to approval and credit terms. Questions about the best account for your fuel usage? A Simpsons Caltex StarCard can be added to your account and used at any Caltex service station Australia wide. View the Starcard Network HERE. With a Simpsons Caltex StarCard card you have a secure way for your employees to pay with flexible options to set what product categories you want available. Cards can be linked to vehicle registrations with the option to input odometer each time you fill up.